There is still one more week to join in our Altered Playing Cards challenge and thus maybe become the winner of the awesome Redlead stencils! What a beautiful collection, isn't it? We love the muted colours, the torn paper piecing that leaves some areas of the playing cards visible, which adds a lot of contrast to the design. The Fimo stamped embellishments... they are simply awesome! Thank you, Monique, for sharing them with us! Please, feel free to grab our spotlight badge and display with your blog. Time for a spotlight, isn't it? I really struggle every time when it comes to choosing a project to spotlight as they are all special creations with a lot of thought put into and very creative pieces - which makes me very proud to feature with our challenge blog to be honest ;). But choose I must - so I decided for Kati's awesome couple of APCs to showcase today. I love that slight sheen of gold with the big gears and the wonderfully muted colours along with the contrasting white from the stamped images and the cards' corners, also the stamped script that adds beautiful depth - the parts all blend together so very well! So - applause, applause for Mamapia aka Kati's brilliant make! Please, grab our "spotlighted badge" to display with your blog if you please, Kati, and thank you so much for sharing this creation with us "chez SanDee&amelie's"! Hope to see your creations with us soon! ...are Redlead PaperWorks, who specialize in rubber stamps (love 'em! ), papers, trinkets and workshops. Chris and Sharon, the owners, have generously sponsored us for this month's challenge with a package of three awesome 6x6 templates they sent me, so we can give them to this month's challenge winner! THANK YOU SO MUCH! Redlead have a lot of ATC sized stamps, which I really love to use. Their on line shop is well worth a visit! 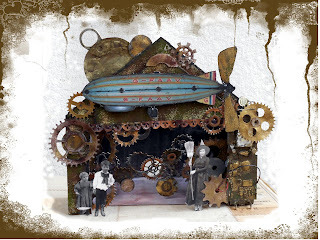 (Remember the rusted tiny house I used with my seven dwarves image for the last challenge? It's from their shop too ;). Still more than two weeks to go for our "Altered Playing Cards" challenge to get the chance to be our prize winner! See you (and your entries) and Happy Crafting! Once again: WOW and a big THANK YOU !! !- for entereing your amazing, outstanding Project to our Challenge Blog! Huge congrats!!! So very very well done! Please, feel free to grab the "Top3" badge from the sidebar to display it on your blogs! And there was a winner of a prize package for random.org to pick! 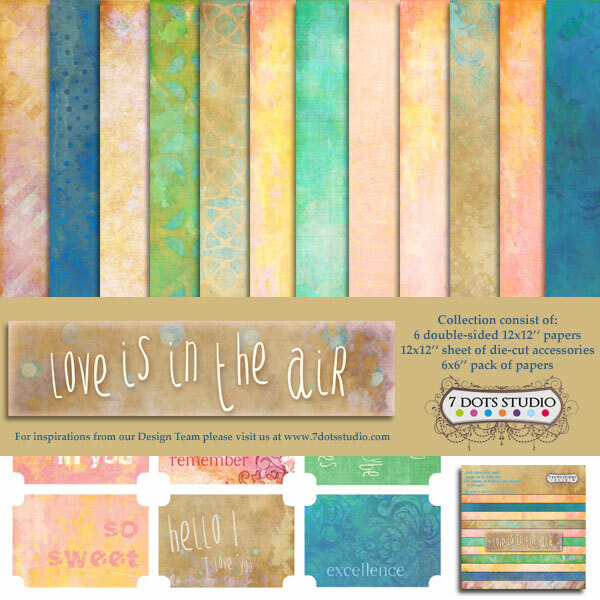 Tusia from Mixed Media Place was again so generous to sponsor our challenge with the awesome "Love in the air - Collection!" from 7 Dots Studio. Congrats, Alexa! Have fun with your prize! Please, contact us for further details (see side bar "contact"). Our actual challenge "Steampunk APC" can be entered here! We would love to see some more fabulous entries from you!!! 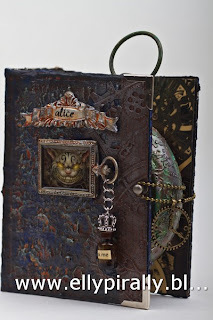 May Steampunk Challenge - "Altered Playing Cards"
April has passed (too fast) - so it is time for a new challenge here with us at SanDee&amelie's. Again we had lots of awesome entries - so choosing Top3 will be a hard job .... but of course we will announce them - aaand the randomly drawn prize winner too! - in about a week, so come back to check if you are one of them. (So there is no separate 3D collection this time due to the theme). All you have to know is: one corner of the card still has to be visible, showing the symbol of the playing card! Everything else is up to you and your imagination - and some good Steampunk of course! Rosie from "Rosies Bastelwelt" luckily said "yes" to being once again our Guest Designer and she even suggested this month's challenge theme, which we really enjoyed trying out! 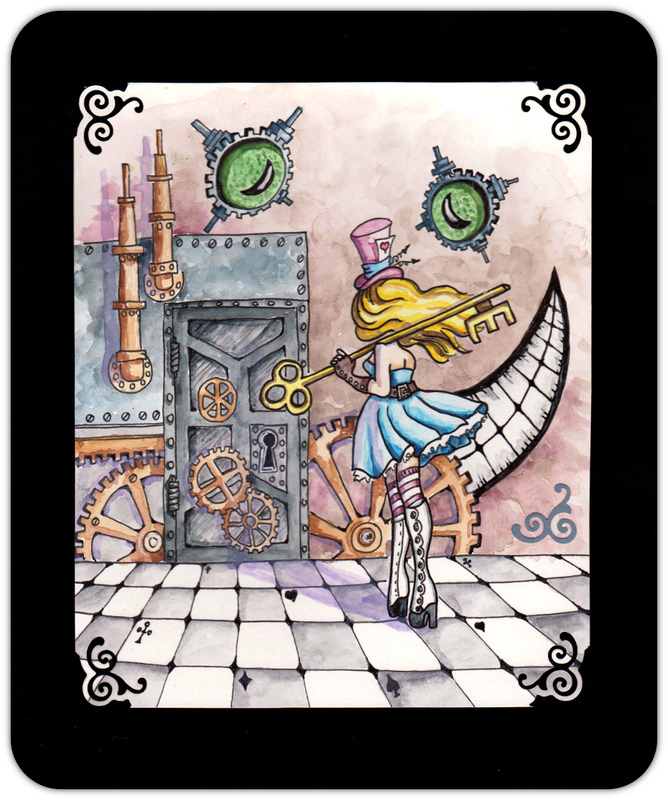 Go have a look at her wonderful series of altered playing cards and the projects of the DT! 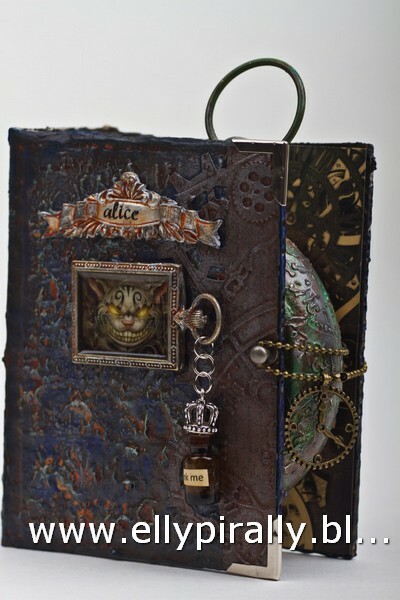 We hope you will find some inspiration for your own altered playing card projects! Last month we learned a bit more about Mark Perry. (The Male Crafter). This month Rosie also was willing to do a little question and answering session with us so you get to know her better. (As she is a German native speaker, this time we also provide you with the German version of the interview alongside with the English translation). 1. Wie bist du zum Stempelhobby gekommen und wie lange machst du das schon? Ich bin seit Anfang 2005 im Vorruhestand (war Bankangestellte) und bin nach etlichen Hobbies, wie z.B. Stricken und Holzverarbeitung an das Kartenbasteln gekommen, zuerst waren es 3D-Karten. Ich war in verschiedenen Bastelforen und mir gefielen die gestempelten Werke so gut, dass ich 2009 mit dem Stempeln angefangen habe. Es war sehr kostspielig zu Anfang. Aber es macht mir immer noch sehr viel Spaß. 1. How did you get around to stamping/crafting and for how long have you been doing it? I have been on early retirement since 2005 (having worked as a bank assistant) and trying out a lot of hobbies as knitting or wood working before I began making cards. Mainly 3D cards at the beginning. I was a member with some crafting forums and liked the shown stamped projects so much, that I started stamping in 2009. At that point it was quite costly I have to admit... I still enjoy stamping a lot! 2. Welches ist/sind dein/e Lieblingsstempel? Welches waren deine ersten Stempel? Ich habe ein recht große Stempelsammlung. Kann nicht sagen, welches nun meine absoluten Lieblingsstempel sind. Mir gefällt das Collage- oder Szenestempeln sehr. Ich mag aber auch gerne Landschaften stempeln und kolorieren. Meine ersten Stempel waren Blumenstempel von La Blanche. 2. Tell us about your favourite stamp/s. Which were the first stamps you bought? I own a rather large collection of stamps. I don't have any absolute favourites to be honest. I especially like collage- and scene-stamping. But I also like stamping and colouring landscapes. My first stamps were some flower images from LaBlanche. 3. Welches war das unnötigste Teil, das du je für dein Hobby gekauft hast? Eine elektrische Slice-Schneidemaschine mit verschiedenen Motiv-Karten, mit denen man z.B. Schnörkel, Tags etc. ausschneiden kann. Sie steht seit Jahren im Schrank. 3. Which was the most unnecessary tool you ever bought for your stamping and crafting hobby? That was a Slice Cutting Machine for die cutting scrolls, tags and such. It has been standing in the cupboard unused for years now. 4. Kannst du in Urlaub fahren ohne etwas zum Stempeln/Basteln mitzunehmen? 4. Can you leave on a holiday without taking anything "crafty" with you? 5. Steampunk: was macht für dich das Besondere an Steampunk aus? Mir gefällt dieser romantische und metallische Steampunk. Ich meine, ein Zahnrad macht ja noch keinen Steampunk. 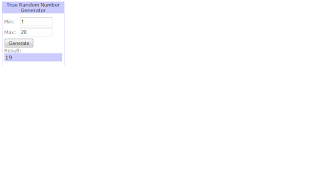 Die Zusammenstellung von z.B. Dampfmaschinen, schönen Frauen und/oder Männern mit Schnauzbart sowie Blumen und/oder Metallembellies finde ich sehr reizvoll anzusehen und natürlich auch zu verbasteln. Es hat ja auch einen gewissen Vintagecharakter und deshalb liebe ich es zusätzlich. 5. 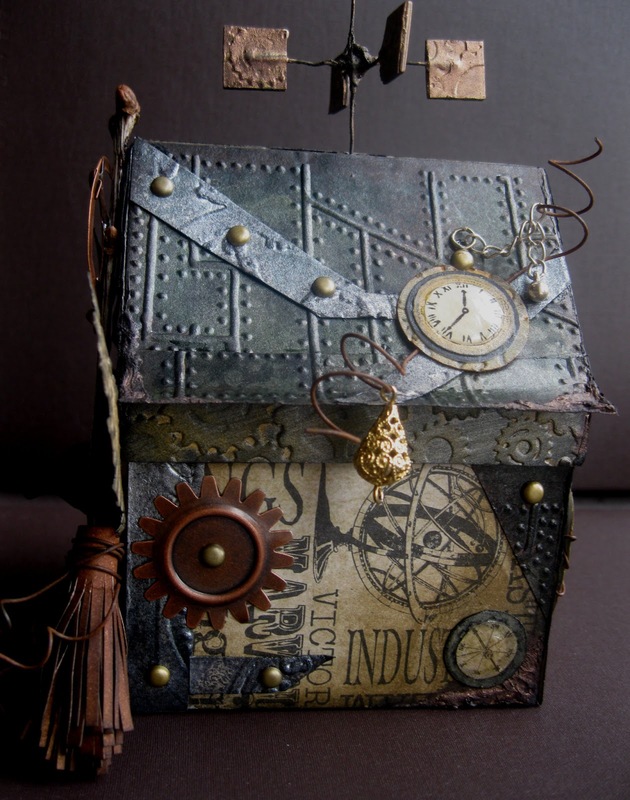 Steampunk: what makes it special for you? I love romantic and metal Steampunk. I would say that one single cog does not make something Steampunk. 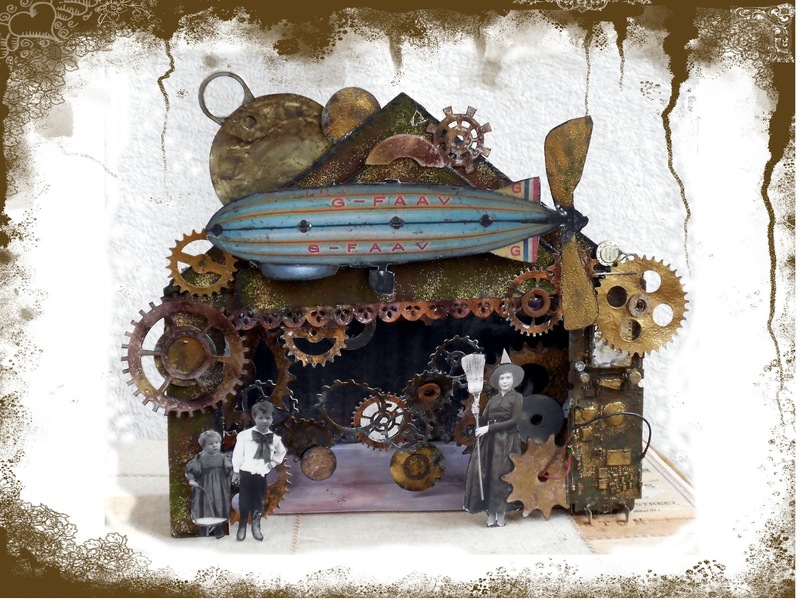 It's the combination of steam engines for instance with beautiful women and/or men with moustaches, flowers or metal embellishments, I love and like to create with my projects. I also love Steampunk because of its vintage nature. As usual the challenge collection can be entered during the whole month (no extra 3D collection this time). We would love to see your projects here with us soon!